Softer Pinker Sounds of Christmas – Stocking Stuffer for the traveler! This season give the gift of deep sleep or at least some quiet time with Sleep Pretty In Pink (for her) and HEAROS Xtreme (for him) premium earplugs! Sleep Pretty In Pink earplugs reduce noise by 32 decibels, providing relief from any distractions like snoring seat partners, airline engines, chattering teens, etc. Super comfy and soft. And they help relieve ear popping and reduce ear pressure! Nice! 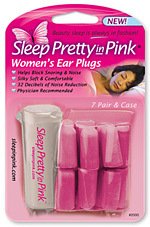 Sleep Pretty In Pink – 7 Pack ~ $5.49 Get the one with the travel case included! Check our their new app for recording, play back and measuring of his snoring!